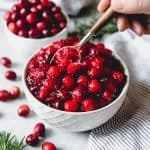 Skip the canned stuff and make this easy homemade cranberry sauce from fresh cranberries, sugar, and just a hint of cinnamon and orange. Fresh cranberry sauce is so much better than store bought and only takes about 10 minutes to make. Combine the sugar, water, and orange juice in a large saucepan over medium-high heat and bring to a boil. Add the cranberries, cinnamon stick, and salt and boil for 1 minute before reducing the heat to medium low and simmering for 10 minutes, or until the cranberries have burst. You can reserve 1/4 of the cranberries to add at the end if you would like whole berry cranberry sauce. Remove from heat, take out the cinnamon stick, and stir in the vanilla extract. Let the cranberry sauce cool to room temperature before transferring to a container to chill in the fridge until ready to serve.